Mike Leigh returns to the Festival with a typical Mike Leigh product: heightened social realism mixing comedy and tragedy - finely observed, and improvised by the actors he often works with. The resulting film is a quality product if less memorable than, say, HAPPY-GO-LUCKY, and less scarring than SECRETS AND LIES. The movie is set around a couple called Tom and Jerry (Jim Broadbent and Ruth Sheen) - solidly middle-class, nice, cheerful, and happily married. They have a 30 year old son called Joe (Oliver Maltman) who through the course of the year finds a cheerful Poppy-lite girlfriend called Katie (Karina Fernandez). They all get on really well. This stands in sharp contrast with the people who surround them and who are, by turns, taken under their wing. 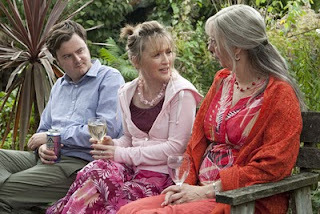 As the movie opens we see Jerry, a counsellor, deal with a depressed woman called Janet (a cameo from Imelda Staunton). And then, the person who really anchors the work is Lesley Manville, playing a lonely middle-aged woman called Mary, who consoles herself by drinking too much and constructing an unrealistic fantasy that Joe will ask her out. Finally, we meet Tom's elder brother Ronnie (David Bradley), recently bereaved, living numb in a grey house. As we pass through the year, we see that Tom and Jerry are kind and sociable and create a lot of fun around them. They are constantly telling people to sit down and have a cup of tea and asking them if they are okay. But, in essence, the people who surround them aren't okay - they are miserable - miserable and pretending, badly, not to be. This is best shown by a superb little end-scene for the character Jack, played by Phil Davis. His wife is ill. Jerry asks if he's okay and he says "Well we try not to let it get us down", but then looks to the ground forlorn. So, how far is the friendship of Terry and June enabling that delusion, by blithely making cups of tea - and how far is it making it worse by presenting these poor folk with an image of smug domestic bliss? To that end, I found ANOTHER YEAR problematic, but I think I was meant to. I also found it, despite the laughs, a profoundly depressing, if well-made, film. ANOTHER YEAR played Cannes and Toronto 2010 and opens in the UK on November 5th. It opens in the Netherlands on November 11th; in France on December 22nd; in the US on December 31st and in Germany on January 27th 2011. I absolutely agree with this review. Tom, Jerry, their son Joe & his girlfriend Katie, are all smug and of no use to any of their miserable friends. Throughout the film food & drink is pressed on to everyone, many of whom should be eating/drinking less. This also means that there is continuous talking with mouths full which is pretty revolting.